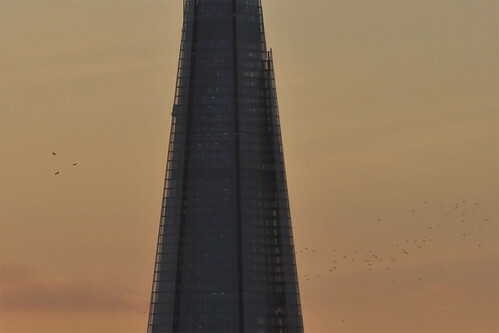 The Shard has taken most of the headlines by claiming the title of tallest building in the EU (and, briefly, Europe, until overtaken by Moscow's Mercury City Tower). But it's not alone: London has an ever-going range of skyscrapers, some designed by renowned architects; some designs great, some... debatable. I take an active if uneducated interest in architecture in general, and the high budgets, awkward sites and sheer visibility mean that good or bad, high-rise architecture will often be more interesting than low-rise stuff, which all too often in this country is the cheap conveyer belt kind. Also, with an engineer for a father, I am intrigued by the ingenuity and ambition of engineering megaprojects of all kinds, and skyscrapers often fit in this category. 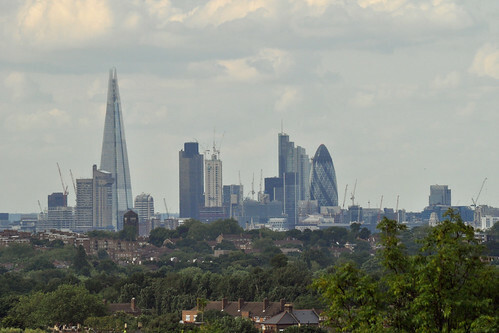 Now, if you're going on sheer height and quantity, we can't really escape the fact that London's skyline is, in world terms, a complete nonentity. Consult Wikipedia's List of cities with most skyscrapers page, and London is entirely absent from the top tables. Not even in the same ballpark as HK, NYC, Tokyo, Shanghai and Dubai, and not close to second tier either. You have to look down to the chart ranked by buildings over 100m (whereas most people contend that "skyscraper" starts at 150m/500ft), to find London... 40th. However, it's not all bad news. 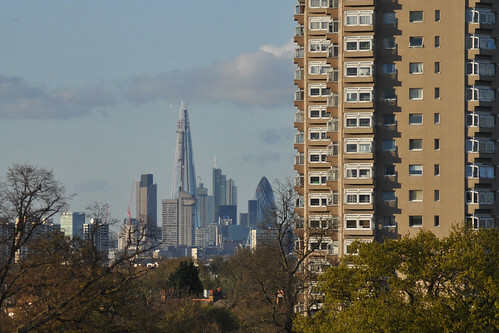 London's skyline has grown a lot (by its standards) in the last decade; we now have the tallest building in the EU, and there are still a few more tall buildings in the pipeline (under construction or approved). Also, there's a case for "quality over quantity". I visited Vancouver this summer and while the sheer density is quite spectacular, individually, very few of the high-rises have anything much to say for themselves. In comparison, the Shard, Gherkin, Strata and forthcoming 122 Leadenhall and 20 Fenchurch St are very distinctive. There's also good variety in the skyline. 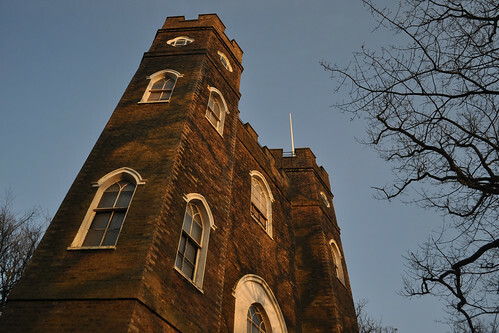 It's not all modern glass and steel high-rises - the relative paucity of these means there's everything from 60's brutalism to 1600's English Baroque making its presence felt on the horizon. 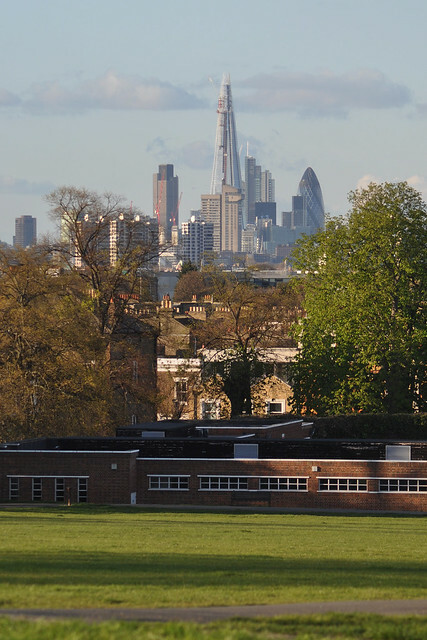 So, where to go to check out London's growing skyline? The view from outside the Royal Observatory in Greenwich is honestly hard to beat, in my opinion. One way in which it stands out amongst this list is the foreground: the magnificent World Heritage Site of the Old Royal Naval College and Maritime Greenwich, hailed as "finest and most dramatically sited architectural and landscape ensemble in the British Isles". Another is the presence of the Thames, sweeping round from the Shard and City to the left, to separate the old Maritime Greenwich from the brash 90s glass of Canary Wharf in front of you. To the right, the growing array of residential Docklands high-rises, Greenwich Power Station, and the O2 complete the panorama. I saw a member of Skyscraper City claim this was the best skyline viewing spot they'd been to, and couldn't resist visiting to see what I made of this bold claim. Turns out, I am inclined to agree. I felt shoddy when I visited, so it turned out to be a flying visit: I admired the view below and went promptly on my way. So I can't really tell you much about the park itself. I was pretty satisfied with the vantage point though. 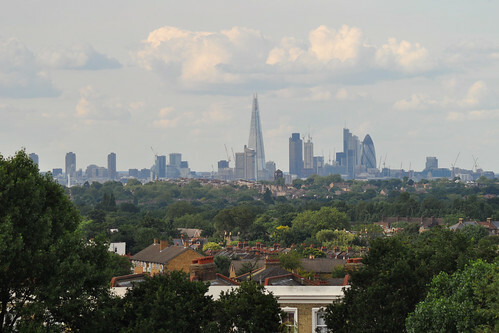 You can get a very wide panorama from the BT Tower to Canary Wharf (see top of blog post). Bang in the middle of it is a nice angle on the Shard and City cluster. Brockwell Park presents a pretty similar angle to Norwood Park, but a little closer in. 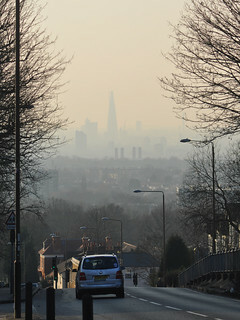 Again, you're looking north to the City, with the Shard appearing to merge into the cluster from this angle. 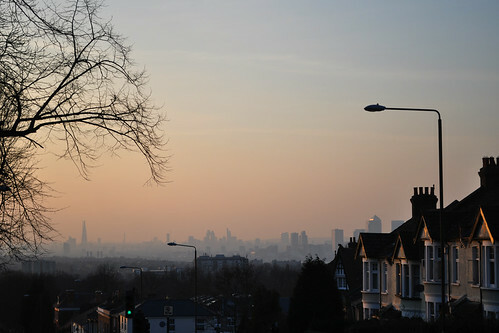 Further east, Canary Wharf looms above the horizon of Herne Hill. You can also see the under-construction St George Tower in Vauxhall, slated as the beginning of a new cluster of high-rise buildings. 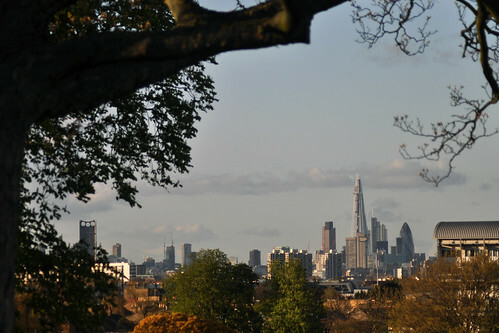 Primrose Hill and Parliament Hill are probably as close to a "default" skyline viewing hill as London has got. 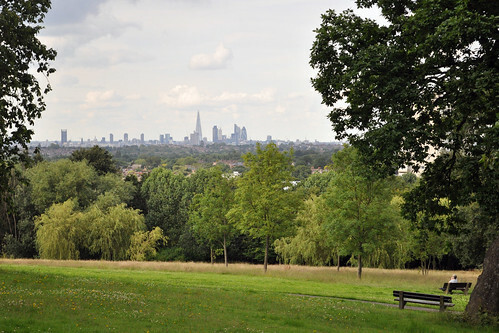 As a south-of-the-river type, it rather amazingly took me until this summer to visit Primrose Hill, and I still haven't made it as far north as Parliament Hill. 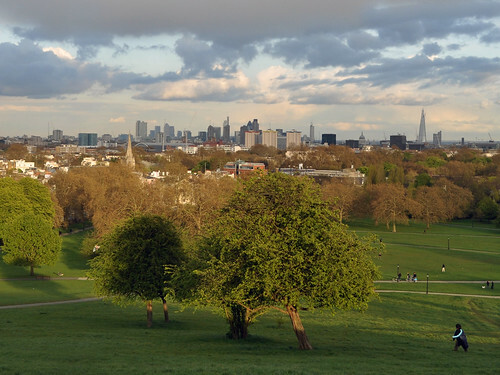 Still, Primrose Hill is conveniently dovetailed into a stroll around Regent's Park or Regent's Canal, and the short climb gives big dividends. 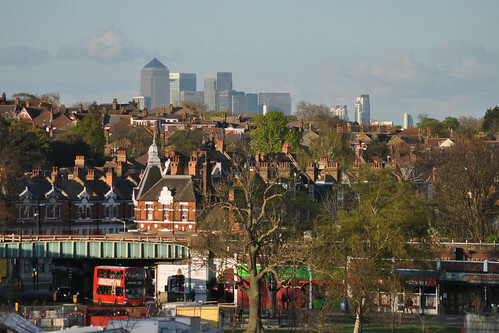 From here, the Canary Wharf and City clusters merge nicely, although the Shard now looks isolated compared to Brockwell and Norwood Parks. 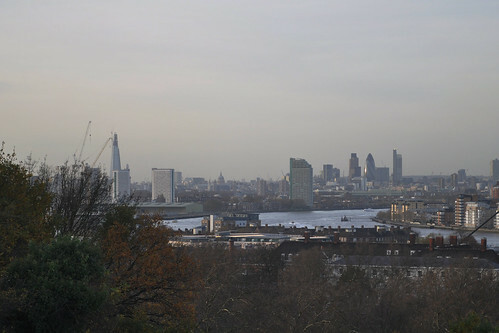 To the left of my panorama, you can pick out the Olympic Park's Orbit, while over on the right are the St George Tower and Battersea Power Station. To someone like me who lives SW, Shooter's Hill feels an awfully long way east. 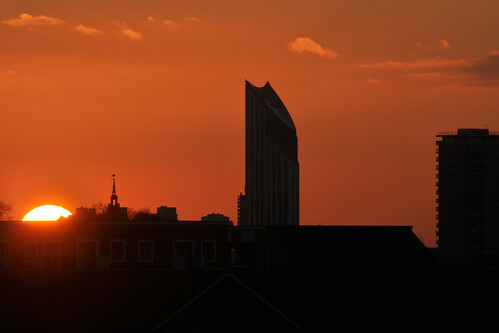 Indeed, being the other side of Greenwich, it is quite literally in a different hemisphere. 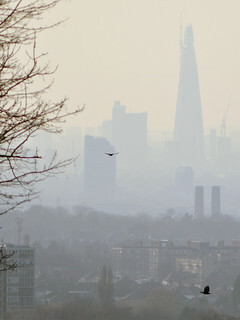 However, the day I went I was well rewarded... if it is fair to use the word "rewarded" to describe smog. While the air pollution is thankfully not as bad as London past, it shouldn't really be welcomed at all; however, if you happen to be taking photos of distant large buildings, or sunsets, it works out quite nicely. The Shard, City and Canary Wharf line up nicely here into one long string of skyscrapery goodness, but I was unable to find a panoramic vantage point that wasn't slightly hampered by lampposts in the foreground. 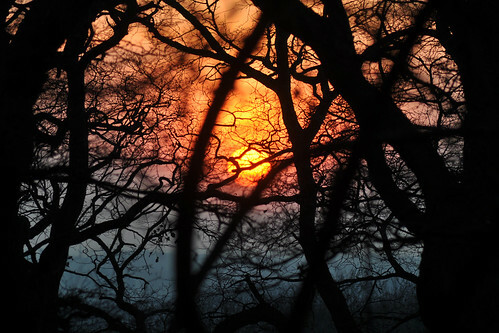 Speaking of curiosities, Stave Hill is another one. A perfect cone 9 metres (30 feet) high, this artificial hill was built in 1985 using spoil from docklands regeneration work. You get an up-close view of Canary Wharf, which for some strange reason I failed to photograph. 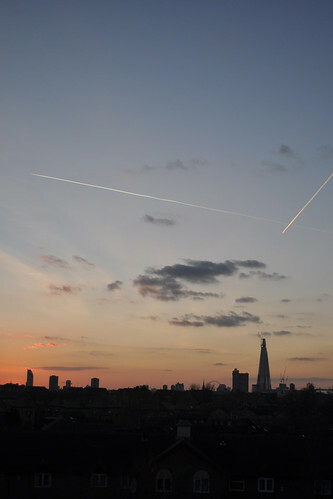 Looking west, the City, Shard and miscellaneous other South London mid/high-rises make a somewhat "straggly" panorama. However, the City itself lines up with almost Parisian precision, and as this view is looking west, the hill is a fantastic spot to catch a sunset. 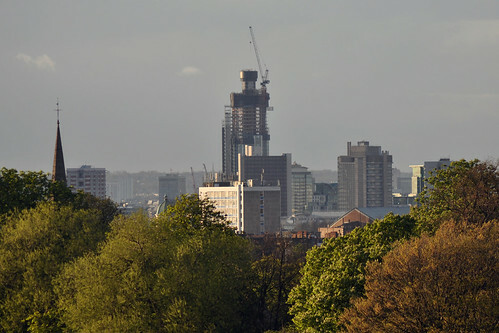 Already mentioned in my opening post about Richmond Park, Sawyer's Hill affords a decent view of the City, from the Barbican estate to the Shard. 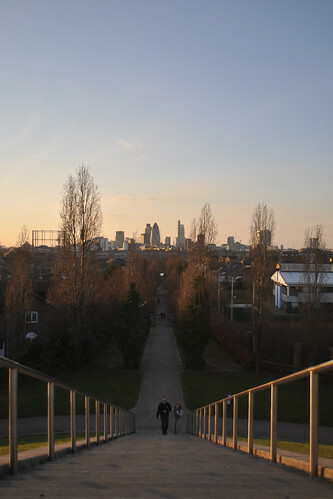 Canary Wharf is also visible, although I have yet to find a way of fitting them in the same (panoramic) frame. 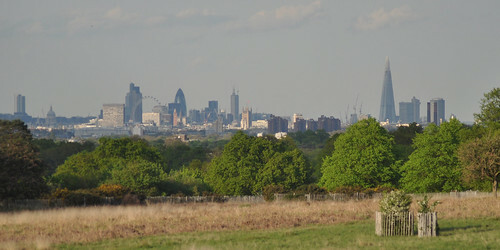 See the Richmond Park piece for the famous protected view of St Paul's Cathedral from nearby King Henry's Mound. Turn left out of Wimbledon Park tube and walk uphill until you see the London skyline emerge above the houses behind you. Battersea Power Station through to the Shard is the main display and again, Canary Wharf is visible, but can't really be squeezed into a continuous panorama. I know that I'm missing Parliament Hill / Hampstead Heath, Alexandra Palace, Crystal Palace, Epsom Downs... Anywhere else? Tip me off in the comments.